Filtering devices for self-rescue with inner mask and combined ﬁlter. General features: Easy-to-adjust and use, made of self-extuingishing, non-irritant, chemical resistant fabric. Large ﬁeld of vision, low breathing resistance, two exhalation valves. Single use products available in one universal size. 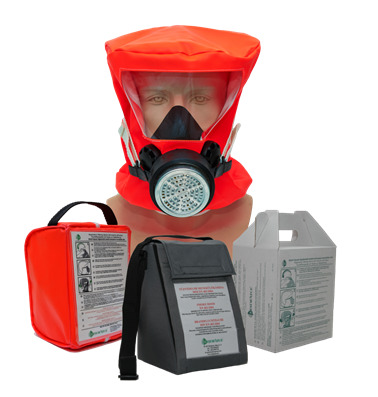 Types: Escape Hood ABEK1P3: ﬁtted with combined ﬁlter ABEK1P3, gives minimum 15 minutes time for escaping from the contaminated area in case of industrial accidents. It protects against hazardous substances, organic and inorganic gases and vapors, acidic gases and vapors, ammonia and organic ammonia derivates. Escape Hood Reactor P3: provides protection against radioactive iodine and methyl iodide, radioactive dusts and aerosols, giving minimum 30 minutes for its user to escape from a nuclear accident scene. Smoke Hood COP3: is intended for self-rescue from ﬁre incidents, where smoke, odorless carbon monoxide and other toxic gases are generated by the ﬁre.